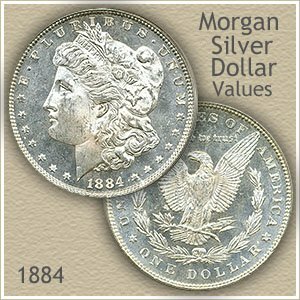 Your 1884 Morgan silver dollar value is increasing because of today's active collector demand and rising bullion prices. Currently it is worth $18.63 . Additionally, by judging your coin's condition accurately and also discovering mintmarks, it often leads to increasing how much it's worth. Let's start with mintmarks. In 1884, silver dollars were minted at four different mints, identified by "mintmarks" placed on the reverse. One mint in particular, Carson City, never produced large quantities of coins. These scarce silver dollars with the "CC" mintmark of Carson City are very popular with collectors and are priced well above other 1884 dollars. See the image below to help locate these mintmarks on your coin. Next, the condition of your coin needs close inspection. If it is well preserved, with most original detail remaining, it is a valuable silver dollar. These nice condition pieces are tops on collector want lists. An example of an 1884 silver dollar in "uncirculated" condition, with no wear to its surface, is pictured above. 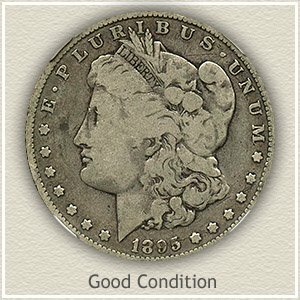 Accurate 1884 Morgan silver dollar value is the combination of judging condition and determining the mint that struck your coin. Look to the reverse of your old silver dollar to find important mintmarks. 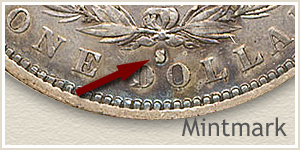 These small letters identify the mint striking the coin. Towards the lower rim, between the "Dollar" and the ribbon holding the wreath is where either the San Francisco mint placed an "S" or New Orleans an "O". Carson City, the rarest of the marks, used the now famous "CC" mintmark. 1884 dollars without a mintmark were struck at the Philadelphia mint. An 1884 Morgan silver dollar minted at San Francisco has an unusual value structure. It is very rare in uncirculated condition. However, worn, circulated examples are available and only valued close to their silver content. Even those with slight wear have only a slight premium in value. Auction records help tell the rarity story of the 1884-S silver dollar. David Lawrence Rare coin auction has sold only eight uncirculated examples since 2004. Compare this to over 200 of the 1884-O New Orleans minted dollar. These eight uncirculated coins are not enough to supply the demand from collectors. As imagined, value of any 1884-S dollar in uncirculated condition is high. Pictured is a nice example selling in 2010 for $4657. Infrequent showing at auction results in difficult pricing data. Certainly any uncirculated 1884 San Francisco dollar is worth in the thousands, it is truly a condition rarity. 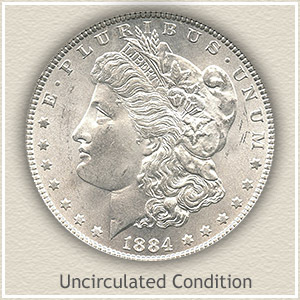 Judging the condition of your coin is one the subtle ways 1884 Morgan silver dollar value changes. Dates and mintmarks are prominent and certain. Grading requires determining the amount of wear, if any, has taken place. Compare your dollar to the images and descriptions. With a little time these small changes in appearance become apparent. Uncirculated: A silver dollar in "uncirculated" condition has never circulated through commerce, thus no wear has occurred to its surfaces. Your coin should exhibit a "like new" luster. Wear dulls this luster and affects the high points of Liberty's check, temple and hair. On the reverse the breast feathers and head of the eagle are subject to initial wear. If the luster is complete on both sides it assures the coin is uncirculated. Extremely Fine: Wear has started to diminish small details of the hair just behind Liberty's ear and forehead. Further behind the ear the folds of the cap are now just slightly flattened. On the revere, small amounts of wear are visible on the tops of the wings, and obvious on the neck and breast feathers. Light overall wear defines an 1884 Morgan silver dollar in extremely fine condition. Fine: Circulation has now reduced most finer design detail to the point of merging. 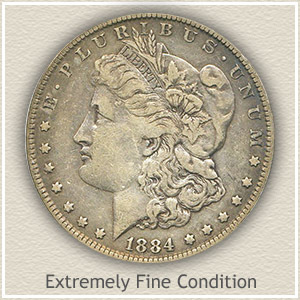 Clearly visible, moderate wear describes silver dollars in "fine" condition. Liberty's hair both above and below the ear is noticeably worn with wide flat spots now replacing the original fine lines. Turning to the reverse, the leaves in the wreath are now very flat, most feathers in the eagle's neck have merged and the very tip of the wings lack any detail. Good: Showing extensive wear and reducing the design to just a few elements, these silver dollars are described as "good" condition. Although the rim is visible, both it and the lettering are flattened to almost level with the fields. The majority of Liberty is without detail. However the eagle on the reverse does show a few remaining feathers close to the legs. In this condition your 1884 Morgan silver dollar value is tied mostly to bullion silver price. Silver dollars are Popular, very Popular... finding a Morgan silver dollar in your box of old coins is finding a coin worth at least $17.98 . 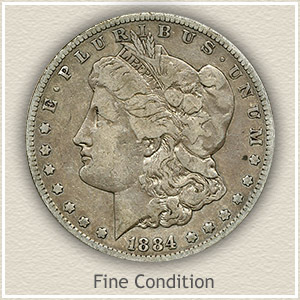 Now determine its date, mintmark and condition, refer to the chart and its value is often surprising. No surprise here, the large size and classic designs insure Silver Dollars are one of the favorites with collectors. Each series is covered in detail, with values listed for all dates and mintmarks, including more on your 1884 Morgan silver dollar value. Compare your coins to images in the sections "How to grade Silver Dollars" and accurately discover how much your old dollars are worth.